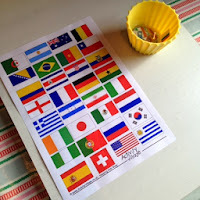 I wanted to use the flags I made for our world cup sensory tray for another activity for T and decided that I'd do a little flag matching game, I got the tiny flags for the sensory tray from a google search, printed them, cut them out and then laminated them. I looked around for a slightly larger printable world cup flag sheet and came across this fabulous one from activity village. I'm actually really pleased with the results of using the 2 different printables because we've got 2 different sized flags. I put the small flags in a pot and asked T to pick one out and put it on the right flag on the printable he did this for about 6 and then got bored! A child with a slightly longer attention span or older child will probably be able to do all of them. If T was a little older, I would have explained which flag is for which country but I think he's too young for that at the moment, although he is recognising the St Georges Cross at the England flag now. 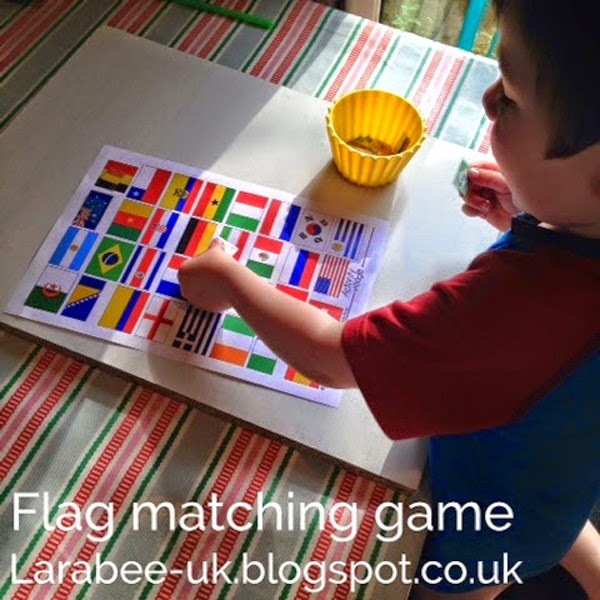 I do plan to try this activity again but putting a treat on each flag which T can eat if he matches up the flag correctly, I think that will hold his attention span slightly longer!